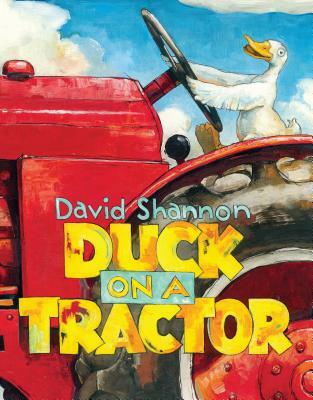 David Shannon's wildly popular, award-winning "Duck on a Bike" left children begging him to tell them another story about Duck after seeing him pictured alongside a shiny red tractor. Now Duck is back and turning the farm upside down! Flushed with the success of his trailblazing bike ride around the farm, Duck decides he's ready to drive the tractor. As in the bestselling "Duck on a Bike," all the barnyard animals share their humorous comments as they watch Duck do the unthinkable. Then, one by one, they join him on the tractor for a ride! But what happens when Duck drives the big red tractor through town, past the popular diner where all the locals are having lunch? What will those folks "really" think when they see Duck and all the other animals riding around on Farmer O'Dell's tractor? Filled with entertaining detail and sly jokes, readers will pore over each picture again and again. Perfect for reading aloud!